Nobody enjoys seeing a beautiful car crash any less than I and anyone who has ever built a car from the ground up will be familier with the feeling in the gut. On the other hand if nobody crashed there would be far less excitement for all concerned. For those who manage to keep the shiny side up for an entire event it is all the more rewarding when we realize what could have happened. If anything the satisfaction comes from knowing the car was properly set up, the driver/navigator performed flawlessly, and luck was on their side. Anyone who has never taken those small steps that went just beyond the edge of the envelope will never know the true essence of taking that extra risk and prevailing. I take my hat off to both. If you don't try you never learn. Thank you to MJB over at ROAD RALLY RHYTHMS for sharing her photos. When I asked my friend Paul Chenard if he could whip up a little something special for the La Carrera get together in Los Angeles on May 10th I never had a clue what he was going to come up with. But since Paul sent me the first proof today I must say I am positively blown away. Anyone even remotely involved with the extraordinarily rich adventuresome and yes even romantic essence of La Carrera Panamericana will appreciate this amazing piece. In 1953 World Champion Juan Manuel Fangio won the Pan Am for Lancia without winning one daily “leg.” But his accumulated time over the entire event was significantly lower than his nearest competitor. He knew how to pace himself and conserve his equipment when others were slowed by mechanical problems. This amazing tribute not only say a lot about Juan Fangio but in fact says a lot about anyone who has ever completed La Carrera Panamericana. This print would be an outstanding addition to any one's collection. For more information about this fine work or other works by Paul contact him at his site IMPRESSIONS OF SPEED. The old photo of Hershel McGriff racing along a steep canyon on a dirt road brought back a lot of wonderful memories of great days in my past. As a boy I tore up may a gravel road in Oregon. As a matter of fact I don't think I knew how to drive around a corner unless I was sideways. Paul's comment below that photo brought back one such memory of a ride I won't soon forget. With my second car which was a 58 Ford I was going fishing almost every other day at the Rogue River which was about 70 miles from home. I would drive up the Rouge River to the Lobster Creek bridge and then cross and then drive up an old logging road to get to a favorite fishing place where my parents used to take there camper. This all took place during the steelhead runs which is usually during a chilly, rainy time of year. The reason I mention that is two fold. First is because the road was slippery and second is because I was heavily dressed to stay warm. Having just left my favorite fishing hole I was speeding back down river to get to another favorite spot and I still had on my hip waders and a couple of sweaters and a very heavy coat not to mention one of those funny looking Elmer Fudd type hats with the fur lining. All of a sudden I found myself going a little too hot into a corner and my left side tires had been sucked into the heavy gravel along the side of the road. Normally this would not be so bad because of all the brush and timber along the road but at this point the timber had been recently logged off so there was nothing but hillside between me and the river. I tried hard to steer out of the soft gravel but that cliff had my name written all over it. Finally I shot off the embankment and flew thru the air until the very front end of the car caught the uppermost tip of a flat mound of dirt. This slammed me "almost" to a stop but not quite. As the front end dug in the back end came over the top and flipped end over end and at the same time the car rolled over to the passenger's side. As all this happened I was swung out onto the driver's bench seat because I hung onto the steering wheel. From that same impact the back seat had flown out and up to the front just in time as the car was slammed onto it's top. This crushed me between the two padded seats as the car began rolling down a 60 degree hillside on it's side. I rolled for over 375 yards down that hill and let me tell you they do not have rides like that at any amusement park. When my car came to a stop it was at rest on it's passenger door side with me standing up but still crushed between the two seats and I could not see out. Then almost instantly I heard voices asking me if I was still alive. My first question was, "How does my car look? Will my dad be able to tell I was in a wreck?" It was amazing that on this road out in the middle of nowhere that two loggers had turned a corner just in the nick of time to see my taillights going over the cliff. They ran down the hill and with some pry bars managed to pry the roof open and get me out. Because of all the heavy clothing I had on and the freak way the seats protected me I didn't have one scratch on me. 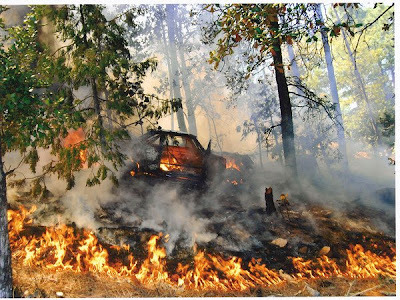 When I finally climbed out thru the windshield I was shocked at my car because it was resting on it's side and had it rolled another two times I would have fallen into the Rogue River on a deep corner where I would have been trapped and drowned. I road back to Gold Beach with the loggers to find a tow truck to pull me out and while I was there I met a tow truck driver and he told me his father owned an old wrecking yard and that there was a sweet looking 57 Ford there that my motor and rear-end would bolt right into. That was the beginning of my automotive career and I never looked back. Funny footnote to that wreck... When I originally called my dad and told him I needed a ride home he asked what happened. I told him, "I just drove into a ditch." After I got home and my dad saw the car for the first time he asked two questions... "What in the hell was name of the ditch you ran into... the Grand Canyon?" And then he asked, "How in the hell can you get both driver's side doors completely ripped off a car but the rear view mirror (mounted on fender) stay untouched?" I just said, "It takes a lot of practice." There is a rumor that after winning the Chihuahua Express Kevin Jones began celebrating and shortly afterwards disappeared. He was last seen by Mark Williams leaving some cantina with a bunch of senoritas. When asked if we would ever see Kevin again Mark replied, "Just be ready when they open the road to the top of Pikes Peak." 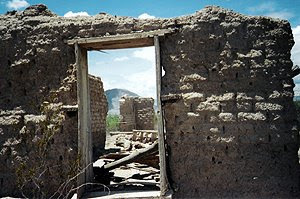 Yesterday the Mexican Paparazzi sent us the following photo that was taken 250 miles south of Chihuahua. 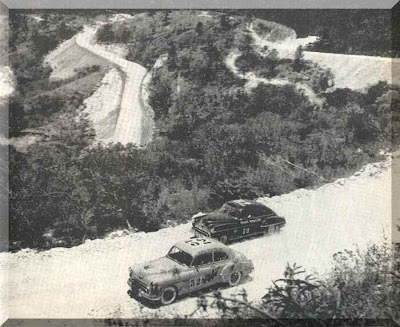 Check out this great photo of Hershel McGriff passing another car along a narrow twisted mountain road in the 1950 La Carrera Panamericana on his way to the big win but more importantly notice the fact they are on a dirt road and no guard rails too boot. This road looks like many such gravel/dirt roads I grew up racing on. This blog is the creation of Carson Scheller's daughter. Carson raced with us in the 2007 La Carrera Panamericana but as is the case with some many of us, he just didn't get enough. In an attempt to feed his racing appetite he made the mad dash down to Chihuahua to run the three day event only this time he was accompanied by his daughter. After reading her blog it seems as if she is suffering from the same need for speed as Carson and the rest of us. 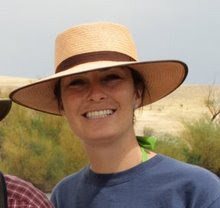 Her blog is titled THE CHIHUAHUA EXPRESS and without a doubt it is one of the top blogs dedicated to this event and if she finds time to do as awesome job reporting on this years La Carrera Panamericana I know where I will be reading. For some great reading about La Carrera style racing and the many adventures that ensure be sure to read her blog. Not only does she give a good overall feeling of what to expect regarding this type of format but in fact she does an awesome job of reporting about many the racers and teams we all consider our great friends. 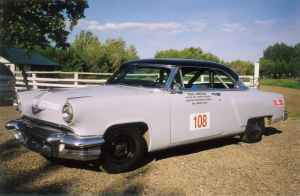 Here is another 1954 Lincoln Capri Pan American Vintage Racecar for sale. While it may not be race ready for the La Carrera it still looks like a great piece of La Carrera history and fun to read about if nothing else. More photos along with more specifics on the car as well as it's history can be found on EBAY or by CLICKING HERE. 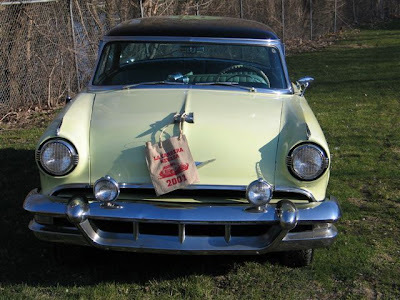 I just love the nice touch of the desert bag hanging from the hood ornament and yes, I can remember the days my parents used them as we drove cross country. The true is, those things work pretty well as the seep just enough to drip back onto the radiator which helps cool things off. 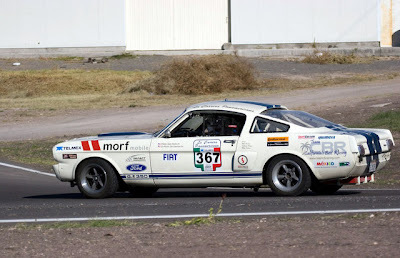 I couldn't help but be concerned when I read their statement of, "It is believed that only one of the original Panamerican racecars exists today" because many of us know this to be un-true especially when you consider at least 5 of them ran in the 2007 La Carrera. Furthermore, I find the statement of, "Built to race in the Panamerican Re-enactment races as well as other vintage racing activities." very misleading since the car is lacking many of the required safety items including a roll cage. Hopefully should some one decide to buy this car they will get someone reputable to advise them on all of the above. A great place to start would be to contact the THE ROAD RACE LINCOLN REGISTER. This video des not cover all the cars but allows you to experience some of the favor of the event. In this month's edition of HOT ROD there is a very good article on Ron Lee's one of only two ever made 55 Kurtis GT coupe which was originally built to run La Carrera Panamericana. Equally as interesting as the car is the well written history of how this car came to be and the famous playes whom were involved. Along with others, this car will be on display at next month's CARRERA FIESTA in Los Angeles. 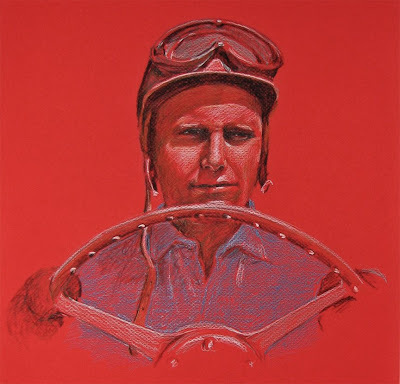 My good friend Paul Chenard sent me this wonderful work of Juan Fangio that he had recently finished and I just had to post it. Be sure and check out more of Paul's work at his site IMPRESSIONS OF SPEED. **CARRERA FIESTA – Los Angeles -- May 10th RSVP NOW! **SPOUSES AND FRIENDS AT LA CARRERA? The second annual Chihuahua Express came of age last weekend. 51 cars participated, with 41 running in the top-speed stage rally competition. 10 cars participated either in a T/S/D rally or the touring class. 31 of the competition cars were from the U.S. By all reports, it was an outstanding event. 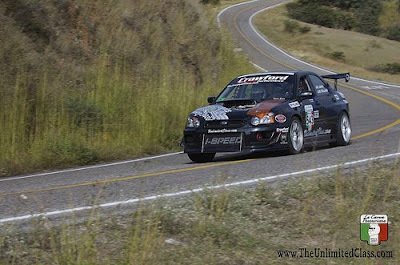 When the dust settled, the overall winners were Kevin Jones and Mark Williams* from the U.S. in a Subaru WRX. The results were not in doubt from the first day. They finished 11:06 ahead of the second place car of John and David Magnuson* (U.S) in their well-prepared Mazda RX7. Third went to Bruce Redding and Steve Shaeffer (U.S.) in a Subaru. They were 12:49 back. 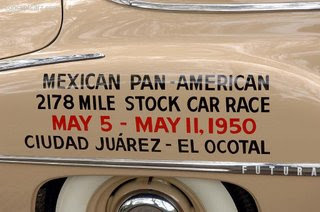 The top Pan Am car, a ’54 Studebaker, driven by Franciso Marquez and Aracelli Ramirez finished in fourth, 20:34 behind the winners. Lars Stugemo, driving a Mats Hammarlund Studebaker, had been leading the Pan Am cars until he crashed the last day. *Indicates they also won their class. Tom Silver and David Fuss (U.S.) won the hotly contested Historic C class and 12th overall when Richard Tyzack (U.K), who had led for two days, developed water pump problems on the last day and apparently was penalized for missing a control station. Doug Allen and Chip Fudge also finished on the podium in Historic C. John Voss (U.S.) and Michel Sharp (U.S.) were on the podium in the under 2.4 liter class. Rookies Mike McBride and Joel Eisenberg did well, too. 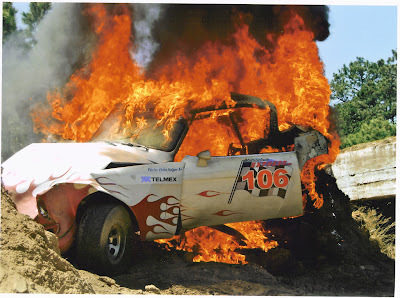 Other casualties among front runners included: Jerry Churchill (engine), Doug Mockett (crash damage), Bill Beilharz (engine), and Mauricio Guerro. Joe Harding and Chris Salyer lost their cars to fire after crashing. There were no injuries, except a broken ankle (Harding). 18 cars were DNF. The spirit award goes to John Schantz and Gabrielle Youngstrom (U.S.). 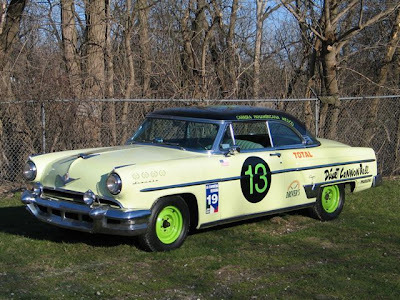 They lost the transmission in their ’54 Olds on the first day, but they found and installed a used one the second day in the parking lot, and re-joined the race the third day to finish 33d overall. Gabrielle also got the best dressed and best ‘too award. Next year special attention will be devoted to modifying the classification system so it keeps up with the wide variety of cars entering the event. Congratulations to the organizer, Chacho Medina, and his group of 75 officials for an excellent race! As of this date, 47 “norteamericanos” have registered for La Carrera 2008. Another fifteen have indicated their intent to participate this year. Several are seasoned Pan Am veterans. Of those who have registered, nearly half are rookies. The entry fee went to $6000 on April 1. The next four applicants will fill our quota of 50 slots for this year. The big question is: will the quota be enforced? If you have not registered your interest in running the Pan Am this year with the Coordinator, then you should plan on participating in the event in 2009. A LCP Fiesta will be held on Saturday, May 10th, 5-8 PM, in South Pasadena, Los Angeles, California at the private hot rod collection of Ron Lee. His collection includes one of two ’55 Kurtis GT coupes, and a ’32 Indy car, plus many beautiful hot rod creations. RSVP is important. Ron must know who is coming by this weekend. A contribution of $25 for food and drink will be appreciated. Please make your reservation now at gbledso@aol.com. Bring photos and DVDs to share. The premium hotels are full, so forget about the Quinta Real in Zacatecas--the famous bullring hotel--if you do not have your name on the list already. If you need a room in Tuxtla Gutierrez before October 23 or a room for your support crew, you should let Monica Grossmann de Leon know at monica.grossmann@yahoo.com.mx. To make a reservation, you must pay for the rooms up front, and there is no refund or transfer of rooms later, says Ms. Grossmann. The names of the actual hotels will be announced a week before the race. A complete set of rules for the event this year has not been posted on the official web site. Also, the classification of the cars -- in the new chart form -- seems to be only available in Spanish. The roll cages rules posted on the web site and dated 2008 are the same as last year’s. They remain somewhat unclear, especially when linked to the diagram that is also posted on the web site. You need not be a registered competitor to join the convoy and participate in the car show in San Miguel. All cars are subject to approval. If you want to follow the race and drive the same roads in a tour—not officially connected to the event, please contact the North American Coodinator. You must have a car—your own or a rental—to participate. All competitors and friends are invited to the Concurso de Motor Sports in San Miguel de Allende. The Concurso will include several venues for hot rods, classic cars, racecars, and vintage motorcycles. Some of the venues will be judged. All proceeds go to benefit children and families in the San Miguel area. San Miguel de Allende is rated by Condé Nast magazine as one of the top three places in the Americans to visit, and one of the top ten in the world. 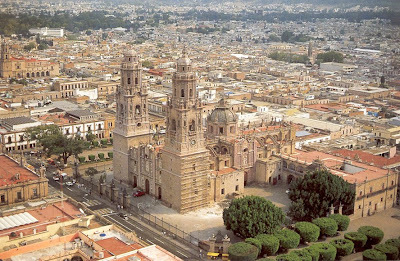 There is no other place in Mexico where you can see a 16th century colonial town virtually unspoiled by modern times. You will also find boutique hotels, art galleries, and a wide variety of restaurants, where you can eat the food and drink the water without concern. SMA is 590 miles—by freeway—from Laredo, Texas, and is served by the airport at Leon-Guanjauato (BJX). Several airlines fly from Dallas, Houston, and LA into BJX. 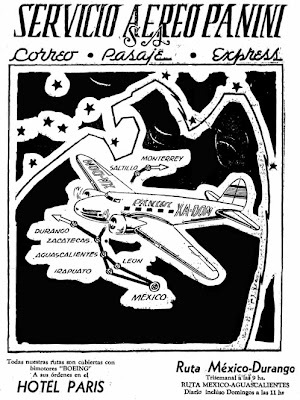 Some flights go into nearby Querétaro. SMA is only 3 hours north of Mexico City by car. 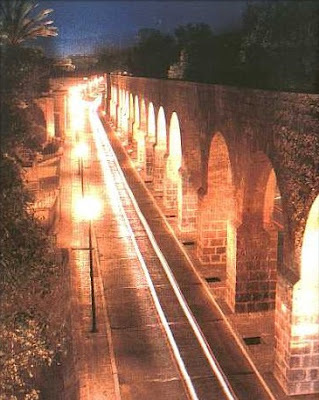 Information about the Concurso will be available at www.concursosanmiguel.org. Hotel discounts and packages will be offered. The Pan Am is a long hard race. The cars and support vehicles are on the road from 6or 7 in the morning until 5 or 6 most evenings. The evenings are devoted to servicing the racecar and waiting for the driver’s meetings to begin. Unless your spouse or special friend understands and truly appreciates the nature of this event, their attendance the whole week is not recommended. However, if they want to sample the event, they might find the preparation of the cars and some of the ceremonies in Tuxtla Gutierrez (Oct. 21-24) interesting, along with the qualifying run and the formal start on Friday. They can fly back to the U.S. on Oct. 24. Another option for them is joining the race for two or three days by flying into Leon-Guanajuato (BJX) and meeting the event in Querétaro (Oct. 27), San Luis de Potosí (Oct. 28) or Aguascalientes (Oct. 29). They can stay with the race until it leaves Zacatecas (October 30). Rental cars are available at the airport, or a car and driver can be arranged. There are flights into and out of all of these cities, but Leon (BJX) is the best for direct flights to the U.S.
A couple nights ago I got one of the coolest phone calls I have ever received. It was none other than Hershel McGriff who won the 1950 La Carrera Panamericana. Of course it would be unfair to point out he won more races than I can count including Nascar, World Championships and more. Hershel called me at home and we spent quite a while swapping stories about things we have in common besides the fact that we have both raced the La Carrera Panamericana. Hershel was born and raised in Oregon like myself and he owned a lumber mill just like my father. We talked about his involvement in the La Carrera Panamericana and we discussed the way things were done back then versus the way they are done today. Even though they didn't have transit stages back when Hershel ran it he said it sounds exactly how things were done when he raced it. I couldn't help but laugh when Hershel told me how many things posted about him on the Internet were completely wrong such as where he was born, his involvement in Nevada mining and more. He does however own a mining company in Arizona and he was gracious enough to invite me down to his home to do an interview for our HD DVD. 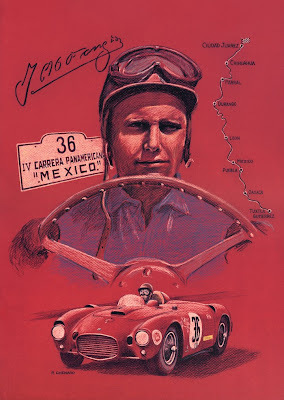 I am really excited and looking forward to meeting another historical figure with regards to La Carrera Panamericana. McGriff's racing career spans four decades of NASCAR competition from the rough-and-tumble 1950s to the finely tuned 90s. He was the winner of the first Carrera Panamericana in 1950, where he met NASCAR founder Bill France Sr. France convinced McGriff to come south and race in NASCAR races at Daytona Beach, the first Southern 500 race at Darlington Raceway. France convinced McGriff to race full-time in NASCAR in 1954. He had his four wins that year in the Grand National series. He had 17 Top 10 finishes in 24 events, and finished sixth in the final points standings. McGriff's average finishing position was higher than points champion Lee Petty. If anyone tells you that the rally type format used in La Carrera Panamericana or the Chihuahua Express is not really racing do me a big favor and kick them square in the Cojones! In this weeks running of the Chihuahua Express over 55 cars started but on the last day a friend wrote they only saw 27 finish. Now anyway you look at it that's not a race for sissys and no it's not because they stopped somewhere for cocktails either. A friend wrote telling me that possibly I shouldn't write about the high attrition because some people might not like it. That's like talking about a boxing match without anyone getting hit. Racers know there are risk and that's a risk they accept. Quite the contrary, if I didn't talk about attrition it's possible someone reading my blog or others like it might not fully give safety equipment the full benefit of the doubt. Folks, THIS IS SERIOUS RACING and not just another Sunday drive. The only reason these people are alive to talk about these wrecks is because they know the risk and THEY TOOK NOTHING FOR GRANTED. Two of the cars above are toast, literally, and they are both good friends of mine whom we met at last years La Carrera Panamericana. Had they taken even the smallest safety items for granted I may very well have not been able to write this entry. Thank God they are safe. After looking at the photos above you can see why we are so concerned about them. 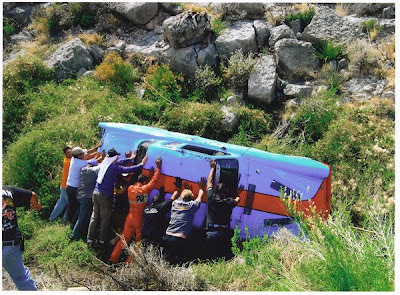 The 1953 baby blue Studebaker driven by Lars Stugemo of Sweden and his co-piloto Filipe Argueles of Mexico took a dive into a drop-off ravine after rolling. 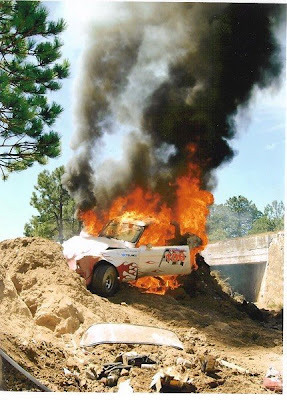 Englishman Joe Harding and Co-piloto Paul Lisec took a trip to Hell (fire and all) in his beautiful 1963 Falcon Sprint. Joe is now back in the U.S. with what might be a broken ankle. Talk about heat, note the seats in Joe's car are completely burned away only minutes after the fire began. Both Joe and Lars are very competitive drivers who have our respect besides the fact that both are fine gentlemen we are proud to call our friends not to mention both had outstanding cars we loved. I hope both teams will be able to pull something off soon since both are already entered in this years La Carrera Panamericana. Ironicly, the white 1953 Studebaker with the red flames painted on the side belongs to Chris Sayler. Chris has run in previous La Carrera Panamericana's and based on photos of previous experiences he has had I can tell you he knows just how important safety equipment is including a good roll cage. I just talked to Gerie Bledso and even though Gerie was rushing off to dinner/awards ceremony I was able to get a few quick results. High overall was taken by Californians Kevin Jones and Mark Williams! All Hail Technoviking! Congratulations guys. Another Californian team of John & David Magnuson who run with us in NASA took 2nd place overall. Another awesome Californian performance was none other than Gerie Bledso. Not only did Gerie win first place in the demanding Historic C class but took 6th place overall honors as well. What a way to represent guys! Hurry safely home and finish filling us all in with "The rest of the story." 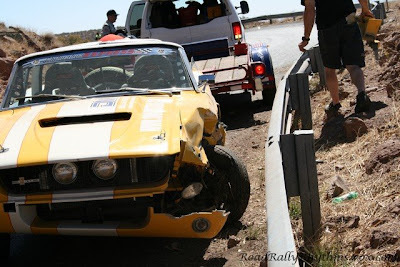 A few other quick notes are Doug Mocket and Angélica Fuentes are doing OK in spite of having a serious run in with a guardrail which took them out of contention. Richard Tyzack's car lost a water pump and he too became yet another statistic of attrition. There is still no official medical report on Joe Harding's ankle and he is on his way home as I type this so as soon as I hear anything I will post it here. Joe is one tough competitor but one we want to see around for a lot of years so let's all say a prayer for Joe and keep him in our thoughts. As for the rest of the results as soon as I hear what they are I will get them posted. As far as the reports of the teams who were burnt as a result of a crash as soon as I get more accurate information on them I will popst that as well. In the meantime let's hope and pray that was not serious. There is a game kids play in school where they whisper something to the person next to them and then they do the same until it passes around the room. All too often by the time the story gets back to the first person the facts are quite distorted. The same is happening with regards to reports I get about the Chihuahua. What we really need is to send Bret Haller down there to get things sorted out first hand for those of us who can't be there not to mention his awesome selection of photos. As friends (who are busy trying to focus on the race) send me brief blips and pieces I find it difficult to get a good overall understanding or at least an "accurate" picture of all that has transpired in the fits two days. What I do know thanks to friends and Bret's site over at The Unlimited Class is that Kevin Jones and Mark Williams are in first place for overall. How cool is that! Stay focused you guys. I have also heard the attrition rate yesterday was high but even so I still don't have all the facts. I heard of some fires and some roll overs but I don't know who or the outcome. Todd Landon's Shelby was crashed bad enough that it was loaded up to go home already and a good friend also wrote telling me that Doug Mocket, Joe Harding, Carson Scheller, and a blue Subaru all tangled with the same guard rail. Other than a report that Joe Harding's ankle might be broken everyone is fine. Let's keep Joe in our thoughts and hope he's fine. 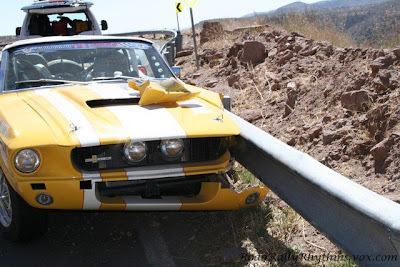 Bret reports that Doug Mocket had an electrical problem but according to someone else "Doug had an unfortunate association with a guardrail and the Olds was a wee bit out of order. Phil and the gang are fixing the car in the parking lot." Yesterday there was a post on the Chihuahua Express website that said, "With the roar of the engines was starting the first day of competition of Chihuahua Express with the leadership in the hands of Kevin Jones in his Subaru WRX; Followed by Doug Mocket somewhere Olds. Super 88 who fight for the second-second triumph, the excitement continues despite the mishap starring Richard Tyzack in his Mustang GT." but I just heard that Tyzack has not wrecked his car so once again I am left wondering just what in the hell is really going on? The old saying is, "No news is good news." but I have to disagree. The worst part of the racing coming out of Mexico is the reporting of it or should I say the lack of reporting. 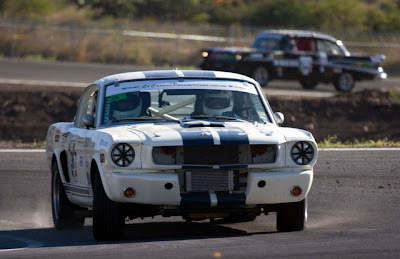 When we competed in La Carrera Panamericana I tried as hard as I could to keep my blog updated so that friends and fans of La Carrera Panamericana back home and around the world could keep up at least on a daily basis. But you have to keep in mind, each day after a long haul and then we had to get to our hotel rooms shower, then catch a taxi and go find the dinner/award ceremony somewhere in hell and gone which took up an unholy amount of time. By the time we got back to our hotel rooms the last thing we felt like doing was sit at some computer which was in Spanish and usually on a dial up line. To make matters worse there was 20 other people usually waiting for the same computer which had no way to download photos. If I could ask that one thing be changed it would be to have someone do great day by day reporting of the whole event complete with photos and stories about the teams as well as how everyone finished in the overall and class standings. 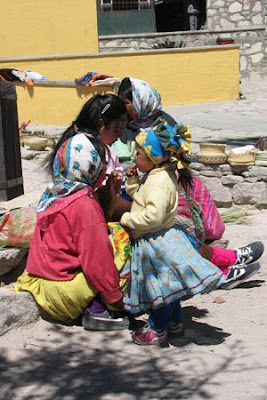 Yesterday was the first day of the Chihahua Express and I have only been able to get sparse to little of nothing reports as to what's happening. Even the Chihahua Express website news section talks about what a great race they are having, squealing tires, roaring engines and so on but unfortunatly they say nothing about anyone we would like to hear about. I heard Landon's mustang bounced off a guardrail and something about Richard Tyzack crashing again and something about someone getting burned in a fire after a roll over but other than that they have no information as to who was burned and so on. It sure would be nice to hear how the teams are placing and if you're going to tell me someone got burned at least tell me who. The bottom line is by the time the reports fizzle in long after everyone has returned from Mexico nobody will care as everyone will turn their attention to La Carrera Panamericana. Would someone please tell us how our friends are doing! I am always amazed how big the racing world is and it never ceases to amaze me how often we can stumble into someone who has been actively involved with La Carrera car let alone how often we happen to find an exciting La Carrera car. Just yesterday I was blown away when I found out about another La Carrera car right here where I live in the San Francisco Bay Area. Not only is it an exciting find but having just spent a very exciting day with Frank Ruppert who in fact involved in sponsoring these very cars what a pleasant coincidence it was in deed. 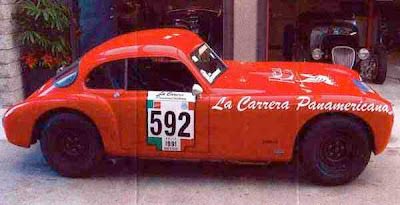 The car owned by Tony is a 1954 Lincoln Capri La Carrera Panamericana race car. According to Tony, this car can race in the Original Pan American class. It has the original engine, transmission and rear end. This is a tribute race car that was built several years ago and raced in Washington, Oregon and Nevada. It has a 6 point Roll Cage, Fuel cell, 5 point seat belt harnesses, Heavy duty suspension and heavy duty wheels, Hi Speed 130 MPH tires, Modified original 317 motor and original auto transmission with a positive shift kit, custom dual exhausts, 368 modified Lincoln heads, a hi-lift cam, a 368 4 barrel intake and new Edelbrock Performer carb, pertronic electronic ignition, new 900 CCA optima battery, new hi-torque starter, power steering, power brakes, power windows, tinted glass and is rewired to switch out all lighting circuits for reduced voltage drag for racing. This car was built to race in the vintage 1949 to 1954 PanAmerican Race Car race car class. Now California registered and street legal and for sale for $36,500 in USD. Tony says that you can fly in and drive home anywhere or he can help with shipping and handle the paperwork with customs too. If your a serious buyer you can call 650-348-8269 oir email Tony at tonyleo@pacbell.net for further details. How cool would this be to run an original Pan Americana car that won so many historical races! 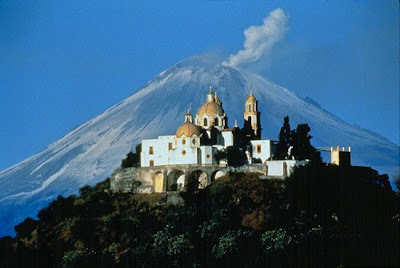 From the way things are looking up just like the volcano Popocatepetl which is located near Puebla whose name is the Aztec word for smoking mountain I have the feeling this years La Carrera Panamericana is going to be nothing short of explosive. Don't forget, Popocatepetl spouted off last year causing thousands of people in Puebla to be evacuated. I have to tell you, this years La Carrera Panamericana is looking like one hell of a great race. Anyone who wins a stage is going to have to overcome some serious competition to do so. Having competed at a world class level in another sport and having raced cars with some of the best teams/drivers in the world I have learned there is nothing that can turn things up a notch more than stiffer competition it's self. Show me a sport with very little competition and I will show you a sport that is boring to watch. This year's LCP is looking anything but boring. In the Turismo Mayor you have a very good size class of cars with some excellent drivers and crews and after giving it some serious thought I wouldn't be so fast to assume just because someone has a lot of races under their belt that they will win. Well set up cars, a great crew and a lot of luck will be required in all cases however, to have competed in the LCP on numerous occasions has to be a BIG asset in winning this race. Turismo de Producción class looks like a blast to run as well and this class has some sleepers that can't be overlooked either. Historic A and A Plus have their hands full too and this class will be exciting to keep and eye on. Historic B has something else going for it that really has my attention and I can't wait to see the outcome. This class has some beautiful cars including some awesome Jaguars but what has my attention is a whole battalion of Mercedes and Porsches that are running against a lone wolf Corvair. I recall a campaign add that Chevrolet had the first year the Corvair came out that said, "CORVAIR... THE CAR THAT WILL SEND THE VOLKSWAGON BACK TO GERMANY." If ever there was a time to shine this could be it. I can think of no better car to paint "The Little Engine That Could" than that Corvair. Ahhh, Historic C... Anyone who knows me knows how dear to me this class is. As usual there is no more competitive class than Historic C and without a doubt this is THE Battle Royal. With almost 25 cars in this field there is an awesome representation of Fords in the form of Mustangs, GT350s, Monte Carlo Falcons and even a Tiger. As far as Chevy's go so far there are four, one of which is none other than Gerie Bledso himself and we all know Gerie knows how to turn things up a notch or two. Another thing that's very interesting about this class is how many different countries the teams are coming from. Literally all over the world. Jon, did we start something here? Original Panamericana... Now if there is a class that would be considered the Crown Jewel of La Carrera Panamericana this would be it. While these cars may not have all the trick suspension and horsepower that some other classes offer without a doubt they have more elegance and class by far. These are the true historians that carry the real torch which in turn keep the true Spirit of La Carrera alive. To anyone who has not had the pleasure of running in La Carrera Panamericana let me offer some advice. MAKE SURE you take time to spend some time checking out these cars like the Original Panamericana. Ask questions, learn about their involvement and history and the men that drove them back in their era as well as this year. So many times we become so involved in the cars in the overall or just in the top three that many times some of these awesome machines and their drivers are overlooked until we return home only to miss out on a once in a lifetime opportunity. On the other hand don't make the mistake of missing out on any of the classes or cars that run this amazing race. In my opinion one of the single biggest problems with the La Carrera is when the teams drive into a city to a welcome of hundreds of thousands of serious race fans. Before your car comes to a stop you will be surrounded by people wanting autographs and photos and simply just happy to shake your hand or meet you. And I must say it's very good for one's self esteem and ego. But take in the whole experience by taking a walk around and head to the front and the back where you can meet other teams and check out their cars and hear stories. When we ran in the 2007 LCP by the time we had spent two hours signing autographs and posing for pictures some teams had not even reached the finish arch yet. For this reason there were times we had already headed off to our hotel rooms and never even knew what some drivers looked like let alone their cars. For months after we returned form last years race I saw photos on blogs of cars I had never seen before that had ran in the very same race as us. So don't make the same mistake and find time to see EVERY car. The next time we run La Carrera Panamericana I have made up my mind I will not waste my time attending the awards banquet and dinner ceremonies. Don't get me wrong, there is nothing tragically wrong with them. On the other hand when you have been in a car racing for 8 hours or more the last thing I want to do is sit in some crowed place when I can be checking out some of the simply breathtaking sites in these old colonel cities and get in some shopping or even the unheard of... Just stay in your hotel room for a whole evening and relax. Keep in mind there are some dinner/award ceremonies well worth attending and The Bull Ring in Zacatecas comes to mind. And don't forget to check out the wonderful people who are entered in The Unlimited Class. These are the cars that will be the future of La Carrera Panamericana. Recently when we had the privilege of spending the weekend with Frank Ruppert it was as if we had stepped into a time machine where were transported to a time where all the cars were brand new ones all of them trying to steal top honors to prove to the world who was dominant. Over the weekend I was very fortunate to get to spend a lot of time with a simply incredible car guy. His name is Frank Ruppert. While many of you La Carrera fans may not be familiar with his name, more than likely you have seen or read about some of his cars or drivers that he and his brother Frank C. Ruppert had part in sponsoring during some of the most historical La Carrera Panamericana races of the early 50's. Unfortunately Frank C. Ruppert (who is Frank's brother with the same name) is no longer with us but it would have been our pleasure to have listened to any input that he could have shared with us since he had so much to do with Ruppert Motors involvement and success's as well. Thanks to Frank C. Ruppert's daughters I was able to learn he was equally as amazing. One of them told me that Frank C. Ruppert did own many yachts throughout his lifetime and was considered one of the most accomplished yachtsmen and navigators on the West Coast. It seems both these gentlemen lived glorious lives. I had the awesome fortune not only of getting to meet Frank in person so we could interview him for our soon to be released HD DVD about our La Carrera experience but Frank and his son and his son's wife treated us to brunch at his private yacht club. It goes without saying this was a first cabin experience and one we will not soon forget. Don't even get me started about visiting some of the car collections that Frank is involved with or his yacht. Considering Frank Ruppert is without a doubt one of the most unforgettable characters I have ever had the distinct pleasure of meeting it's difficult for me to understand why everyone hasn't heard of him. Working with his brother Frank helped operated a Los Angeles Lincoln Mercury dealership and several other automobile business as well back in the 50's which took part in sponsoring some of the most famous names that have ever been known in the automotive racing hall of fame. Besides those sponsored, he was best friends with so many other racing greats on a first name basis. Not only did the cars and drivers that Frank was involved with win several of the early La Carrera's but in fact set records doing it many of which still stand to this day. There are too many to name but some of the most famous names in racing drove on that Lincoln team including Clay Smith, Johnny Mantz, Troy Ruttman, Bill Stroppe, and the list goes on and on. All of these drivers raced in other venues as well such as Indy and Nascar. One of Frank Ruppert's relationships was with the youngest driver to ever win the Indy 500. Not only did Frank travel with the teams back in those first history making races but he was instrumental in helping teams develop methods that have carried over into many other venues of automotive racing today. 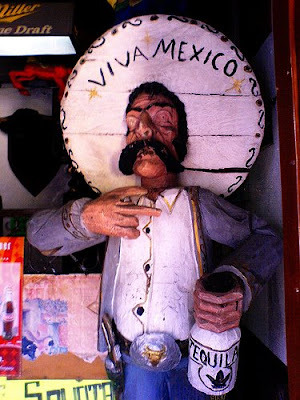 Frank's son and wife brought the winning trophy which was awarded to Troy Ruttman and Clay Smith in 1951 by the Mexican Government which is a one of a kind trophy that requires at least two men to carry around. This is one trophy that you will most certainly not see someone hold above their head on the pedestal. To stand in the presence of this spectacular award is an honor all by it's self. Frank Ruppert has a mind like a steel trap and a wit that is it's equal and when he talks about the days of those great men and their machines you are a captive audience. Our interview with Frank is nothing short of magnificent and there simply isn't enough time in a weekend to enjoy listening to him reminisce about what are possibly the greatest moments that ever took place with respect to La Carrera Panamericana especially when you consider he was there in person. This is just one of many old car magazine adds using one of winning Lincolns that was sponsored by Ruppert Motors. Frank's participation in helping us document and express the true passion felt by anyone having "personal" involvement with La Carrera Panamericana simply cannot be told any better. I cannot wait to spend more time with a man who is indeed the true essence of La Carrera Panamericana. To meet and know Frank is to love him. Just wait until you hear him on our DVD. Have you ever had a memory that you so badly wanted to be able to share with others? Many of us would give anything to turn back time so we could spend a few moments with loved ones or to be able to take our children to a time we cherished when we were their age. Then there are those who we love and miss whom we wish we could have just one more moment with to tell them how so very special they were and still are. For those of us who participated in La Carrera Pamnamericana there is also the deep inner desire to be able to take friends back to the very moments we reveled in so that we could once again feel that excitement and awe and also share it with them and see the look on their eyes that we once experienced. One such moment was the day we finished the exciting run through Mil Cumbre and drove into Morelia often cited as 'the most beautiful city in Mexico', with its fabulous colonial architecture where we parked our race cars right in front of the amazingly stunning 600-year old cathedral and its museums. Even though it's an amazing experience for one's self esteem the whole experience was so much more than just signing autographs and posing for photographs. While we sit in front of colonial style restaurants across the street from our cars and the church enjoying simply unbelievable food we could not help but become engulfed in what has to be one of the most beautiful city settings in the world. This is teh same city we spent the night before our second race back through Mil Cumbre with the sun shining directly into our eyes. This was the same day that several cars ahead of us would suffer everything from running poor, flat tires and yes, even crashing. This video comes as close as I ever could to helping me take you to that place we all love so very much. Come along with Jon and me as we take you for a walk through a place we will never forget and keep in mind, this is only a few moments of an entire week we spent in places equaly as awesome as this. This is the same place where yearly between about October and March, some hundred million Monarch butterflies migrate from the northern climets, some over a distance of up to almost 3,000 kms, to winter. Stay alert.... A Big surprise is coming regarding the HD DVD. Today I had the great pleasure of having a couple wonderful phone conversations with none other than Ben Iskenderian, the brother of the famous Ed Iskenderian. Back in the early 70's when I drove dragsters and hung out at Gotellies Speed Shop, with ole Man Gotelli better known as "Terrible Ted" I was blessed to be able to call Ed any time I needed advice and great advice Ed had plenty of. Today was the first time I had ever talked with Ben but he is just as fine a gentleman as his brother Ed. Before we hung up both Ben and his wife invited me to come visit them the next time I was in Southern California not to mention we would head down to the Isky Cam factory for a personal tour with Both Ben and Ed. That is an invitation I will look forward to and one I will not pass up on. Funny that I would be talking to one of the most famous cam grinders of the racing world from Southern California since on this very weekend our production company and I will be traveling to Southern California to meet one of the most amazing me who has ever had anything to do with regards to La Carrera Panamericana. 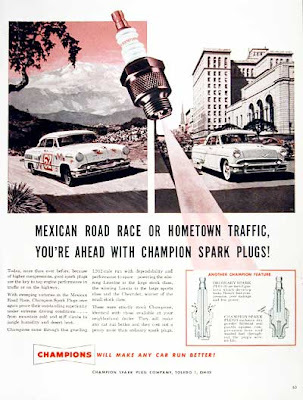 His name is Frank Ruppert, of Ruppert Motors who in fact sponsored some of the Lincoln and Mercury teams that won so many races during the first years of La Carrera Panamericana. One of those teams included Clay Smith. Borrowing a quote from Hemmings.... If you've been around a long time you likely remember the woodpecker decal, the one with the snarl on its face and a cigar hanging out to the left. 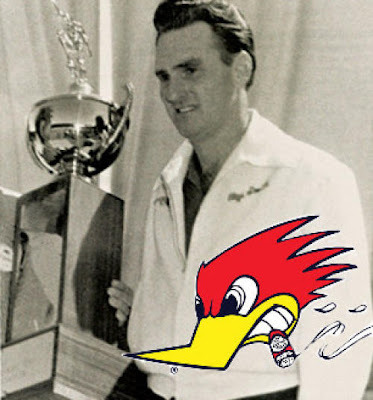 That redheaded bird is a trademark and a characterization of Clay Smith, who was known as Mr. Horsepower and whom none other than Smokey Yunick called "the world's smartest mechanic." Another compliment paid to Smith by his peers was the title "America's Genius Mechanic." So adept at fixing cars was Smith, he could tell how an engine was running by pressing his loins against the body of a car, according to another hot rod pioneer, Ed Almquist. Interesting footnote; All three of these racing giants (Smith, Isky & Gotelli) were very seldom seen without holding or chewing on one of their signature cigars. Frank Ruppert has invited our production company to spend the day aboard his yacht while sharing his wonderful involvement in La Carrera Panamericana. Having spoken on the phone numerous times with Frank I am amazed how many famous drivers, owners and other famous racing rascals he and his brother (Also Frank Ruppert) knew on a first name basis. If that isn't enough excitment to make me crazy then let me tell you about a phone call I had this week inviting me to visit with Herschel McGriff. Talk about feeling like a kid in a candy store! Hershel McGriff has won NASCAR races in the last six decades and won the Mexican Road Race in 1950. When I said our upcoming HD DVD was nothing short of the greatest La Carrera Panamericana video ever made bar none I wasn't kidding so stay tuned. Check out some of the awesome cars competing this year and a very good representation from The United States, Canada, Eurpoe and Mexico as well. Many of our friends prepare to take their cars to Chihuahua Mexico this weekend to compete in a three day race. Sure they will be there for the adventure and to renew friendships with fellow La Carrera Panamericana teams but for the majority it will be to work out the bugs in their cars in preparation for this years La Carrera Panamericana. Not only is it a good idea to see test the car as well as it's equipment such as navigation equipment, seat belts and all the other odds and ends but it's also a good idea to experience Mexico for those who haven't been before. The food, the language, weather as well as understanding the rally type method of racing. For those lucky enough to actually have their cars ready to race this long before La Carrera Panamericana I salute your good fortune. To put things into proper perspective check out these pictures of Lucky and then try to imagine how it all got done in time. Not only did it get finished but we returned after having finished 9th overall not to mention we won the most dangerous stage of all... Mil Cumbres. The top three photos above where taken exactly one year ago today! Can you believe that! Lucky was like a caterpillar that transformed into an amazing Monarch Butterfly that did exactly what Monarchs do... headed out for Mexico. There was a lot that happened since then including the trailer pictured being stolen only a few days before we were to leave. As we grow up we have no conception of how our values will change over the years as we journey through life. What we think would be the ultimate adventure when we are 17years old could in fact be a nightmare by the time we are 55. Marriage comes to mind. But seriously...... On the other hand for many of us, little did we realize that those toy race cars that we played with might just turn into the real thing someday. I suppose when Evil Knievel was a boy he was probably pretending to jump his toy motorcycles across a make believe canyon. More than likely it was much the same as when I was a boy pretending to drive my pretend formula one car around a race track made in the dirt as I made the rumbling sounds in my throat of a race car shifting up and down through the gears. On the same topic, it's funny how growing up in the country many of us felt as if it was the city kids who had it so good and many times they felt the same about us country kids. My mother used to have an old saying that seemed to fit... "The grass is always greener on the other side of the fence". Since I grew up on my parent's cattle ranch I could relate and I often wondered if city kids knew what that old saying meant. It seems no matter how large a pasture is, the cattle always try to stick their necks through the fence to reach just one more clump of green grass on the other side. In my case I lay awake many nights dreaming how much fun it would be to live near the race track. Then there was my biggest dream of all.... What if I lived in some place where there was a go cart track or better yet... someplace where they held the Soap Box Derby. As a young boy who grew up in the 60's I wasn't alone with such dreams and the Soap Box Derby was a dream shared by a countless number of youngsters. But back at the ranch the reality would set in and if there is one thing a country boy that lives 12 miles from town knows how to do, it's how to make due with what you got. Now there was one thing I had that most city kids didn't and that was a long paved downhill road and almost no traffic. 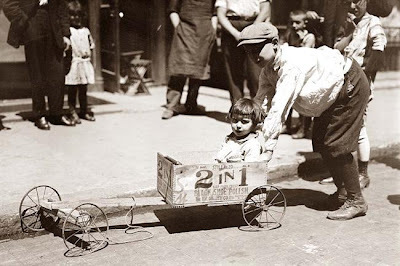 You would be amazed how fast a soap box derby car can go when it's built out of three pieces of two by fours, a wooden apple box and some old wheel barrow or law mower wheels, a piece of rope and a few well placed nails. For 40 years I have wondered if my country boy special would in fact go faster than an official soap box derby car. After all, mine weighed one fourth of any of those full bodied cars. My mother used to scream at me for using her good wooden apple boxes and so again I used my country boy ability to make due and unloaded a wooden box of ditching powder (dynamite for you city folk) stacking it neatly on my father's workbench. This cured the problem with my mother's concern for her precious wooden apple boxes but for some reason my father had a real problem with the fact I left the ditching power stacked on his workbench. I don't think he minded me using the wooden box as much as he did me using a hammer and nails on the same work bench to build my racer next to the neatly stacked pile of dynamite. Boy was he mad at least until dinner than night when he said, "Well if it had blown up Gary never would have heard a thing but that damn racer of his would have gone like hell." Eventually, as I grew older my biggest dream of all came to be when one afternoon I looked out the dinning room window and saw my father unloading a go-cart out of the back of his pickup. From that day on there just wasn't enough daylight and the only things that changed besides my age were the dreams. The dream of adventures of passing through a cheering crowd as I took the checkered flag at the National Soap Box Derby championships eventually changed to driving the winning car across the finish line in races like La Carrera Panamericana. In reality the dream is always with us racers but the wooden boxes just keep getting more expensive.